Please Note: Some customers of UnitedHealthcare Global have combinations of these tools included in their program, but not all do. Please check your program or call your administrator to determine if you are eligible for access. For questions or assistance with the Intelligence Center, email Intelligence Center Support. Visit m.members.uhcglobal.com for our mobile optimized Intelligence Center. Designed specifically for travelers on the go who need to access our key destination intelligence and alerts. 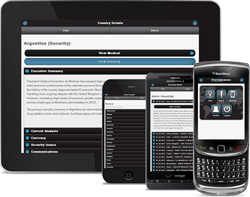 Provides country level medical and security content pulled from our World Watch® and Medical intelligence report online tools (dependent upon your organization's subscriptions). Optimized for reading on most mobile devices. For user instructions, click here.